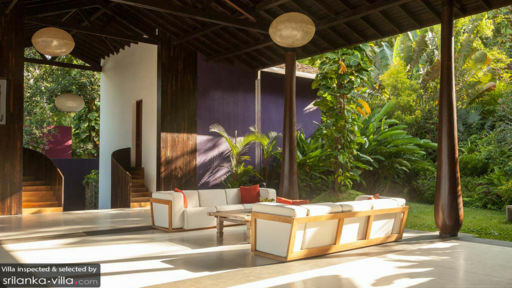 A loft-style holiday villa near Galle Fort in Sri Lanka, Villa Wambatu is an art deco home with stunning architecture featuring Palmyra tree columns that accentuate the traditional and modern aspects of this contemporary space. A unique concept home with airy quarters, the loft is home to five bedrooms including a garden pavilion, to accommodate several guests at the same time. Complete with a swimming pool and outdoor living spaces, the villa is great for a getaway with loved ones in a serene and naturally abundant location. 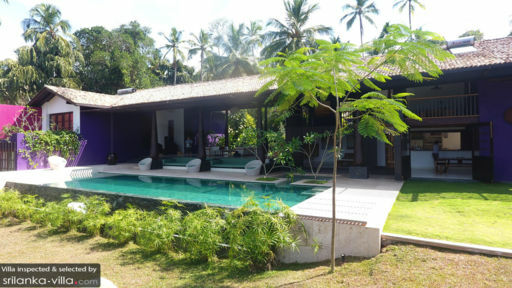 The purple-walled villa features five bedrooms, one of which is found on the gardens in a separate pavilion. The simple bedrooms are furnished with a mix of double beds and single beds as well as minimal décor. Keeping it soothing and inviting, the bedrooms are instantly your home away from home owing to their easygoing décor that features nothing more than a sofa or a desk besides the bed. En-suite bathrooms with necessary amenities are accessible to guests to make your stay even more convenient! With sprawling gardens flush with tropical flora, the swimming pool sports an infinity edge overlooking the lawns at Villa Wambatu. There are palm trees, blooming flowers, and dense bushes that seem to engulf the villa whole. As far as your eyes can see, you have a flourish of natural beauty and splendour to provide a holistic space to guests where kids can run around, play games, or you can lounge under the shade of a tree to read a book or take a nap. Besides the pool, there is a pool deck on which you have rattan circular chairs for lounging post-swim! Right beside the swimming pool overlooking the verdant gardens at the villa, there is a porch furnished with rattan furniture which makes for a sleepy and calming spot where guests can relax with a cup of tea while enjoying the weather. The main living area of Villa Wambatu is a uniquely-designed space with a comfortable, L-shaped sofa against the wall, cabinets that line the opposite wall and selective artwork gracing the room. The room is air-conditioned to keep it cool, especially during the afternoons. The kitchen and dining area are well-equipped to serve your culinary needs with modern amenities and appliances. The dining area can accommodate all guests at the same time for a cosy, family ambiance for guests. A cabinet is dedicated to crockery and cutlery, a double-door refrigerator stands in the kitchen, an island counter provides additional space to guests for quick bites and drinks. Your home for the next few days prides itself in offering quality services to ensure you have a memorable stay. Maintenance and upkeep of the villa is looked after by the friendly staff so you have nothing to worry about. 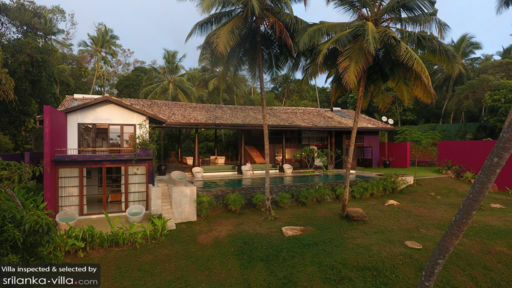 A short distance from the historical Galle Fort, deemed a UNESCO World Heritage Site, the villa is ideally situated and you can take a tuk-tuk to travel to and from the city. The Dutch architecture will surely inspire you and will you to walk around and explore the town!